This question has been a hot issue, since WhatsApp is now a smash-hit instant messaging app among both Android and iPhone users. Almost every day we use WhatsApp for social communication or business contacts, there must be tons of valuable WhatsApp conversations that you want to come along with you when you are switching to a new phone. 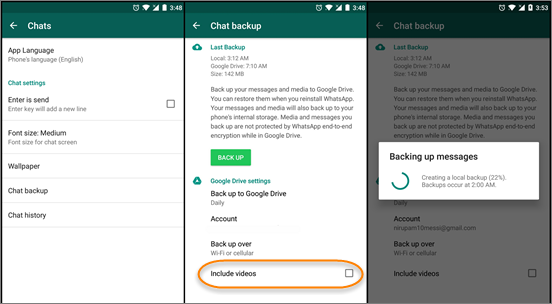 For this, both Android WhatsApp and iPhone WhatsApp have already rolled out a built-in backup feature for users to backup WhatsApp chats together with media to Google Drive on Android phones/tablets and to iCloud on iOS devices. Hence, you don’t need to worry about restoring the backup to your new Android/iPhone. But, if you have recently made a switch from an Android phone to an iPhone, you will find that you are facing a problem to transfer WhatsApp from Google Drive to iPhone. But no worry, in this article, we are going to suggest you two ways through which you can restore WhatsApp backup from Google Drive to Android and iPhone. Open WhatsApp and go to WhatsApp Setting > Chats> Chat backup, and hit the “BACK UP” button. If you also need to backup WhatsApp media, please remember to check the “Include Videos” option. How to Restore WhatsApp Backup from Google Drive to Android/iPhone? Then after that how to restore the WhatsApp backup from Google Drive to your new Android, or restore WhatsApp from Google Drive to an new iPhone? Take it easy. In the following two parts, the article will show you how to accomplish that in details. Once you have created a backup of your WhatsApp data with Google Drive on your old Android phone, it is as easy as pie to restore them to any new Android devices like Samsung Galaxy S9 Plus, HTC U12+, LG V30, Huawei P20 Pro, Honor 10, OnePlus 6, Sony Xperia Series and etc. Step 1. On your new Android, log in Google Drive with the same account that you used to create the WhatsApp backup. Step 2. Install and run WhatsApp on your new Android, and verify your phone number. Step 3. When there is a pop-up window asking you to restore WhatsApp backup from Google Drive, tap “Restore” to confirm it. 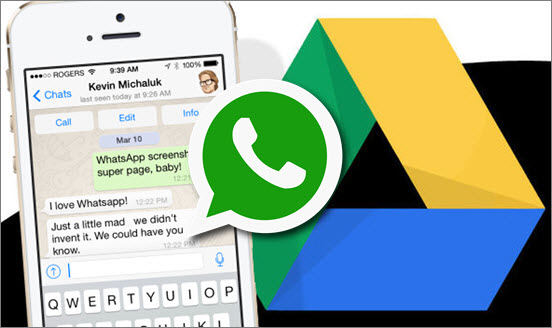 Can You Restore WhatsApp from Google Drive to iPhone Directly? Google Drive uses its encryption protocols as a way of protecting your data from any harmful hacker interception, however iPhone uses a different encryption protocol to what Google Drive does. Simply speaking, the encryption protocols used by Google Drive are not compatible with the iOS system, and this means that it is impossible to restore WhatsApp from Google Drive to iOS devices directly. How to Restore WhatsApp from Android Backup to iPhone? 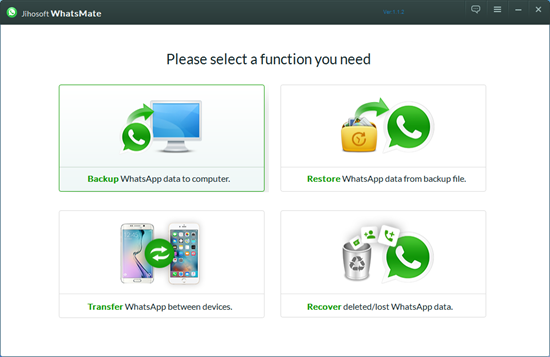 However, you can use an easy way to restore WhatsApp backup from Android to iPhone and Jihosoft WhatsMate must be your best companion to do that. This program is a comprehensive WhatsApp data manager which allows you to backup and restore WhatsApp, and even recover deleted WhatsApp data without backup. So we can make use of its backup and restore features to do the task. Step 1. Launch the program, and select the Backup WhatsApp mode. Step 2. Connect Android phone to computer through a USB cable, and please remember to enable USB debugging on your phone. Then your phone should be detected by the program. Step 3. 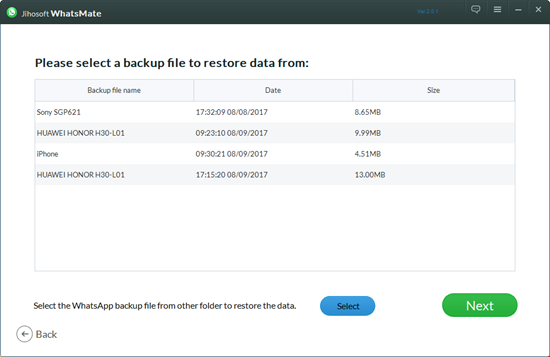 Let the program scan for the WhatsApp data on your phone, and when it finishes, you can select the files you want and click the “Backup” button to backup WhatsApp files to PC. Step 4. Disconnect your Android, and connect the iPhone to computer instead. Step 5. 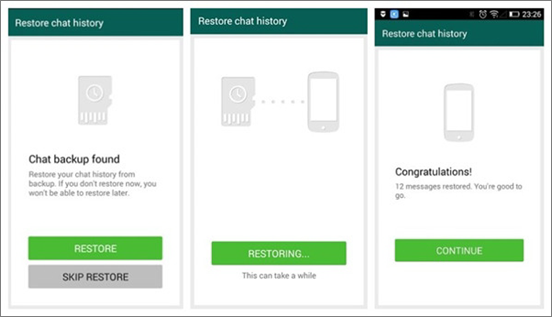 Now go back to the program main interface, and choose Restore WhatsApp mode. After that, you will see the backup you made just now is on the list, then select it and click “Next”. Step 6. Then the program will analyze the backup file and show you all the files inside the backup. You can freely preview them and selectively choose some or all to restore to the iPhone. Step 7. Disconnect iPhone, and open your WhatsApp to check the data which is restored from the Android backup just now. Please rest assured that your old WhatsApp chats on the iPhone will not be overwritten after the restoration. 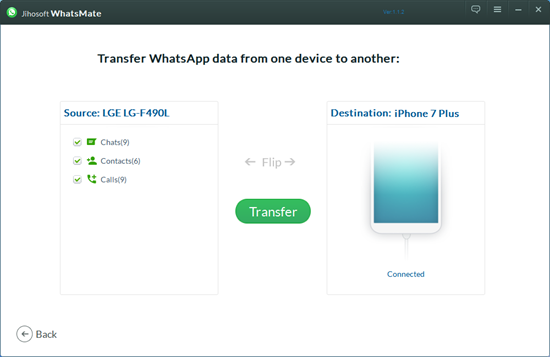 Tip: Is There a Simpler Way to Transfer WhatsApp from Android to iPhone Directly? 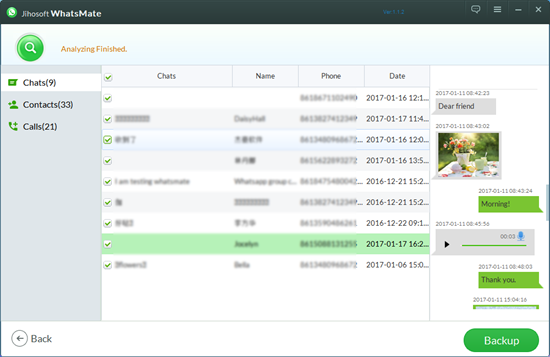 Actually, Jihosoft WhatsMate is also a one-click WhatsApp transfer tool offering a much simple way to transfer WhatsApp data from Android to iPhone in a forthright manner. If you want to get rid of the tedious steps above, you must want to try this pretty convenient and safe way to transfer WhatsApp messages, contacts, call history, photos, videos and audios from Android to iPhone, or vice versa. Step 1. Run the program, and choose the Transfer WhatsApp mode. Step 2. Connect Android and iPhone to the computer via USB cables. Step 3. Select Chats, Contacts, or Call History to transfer. The media files are included in Chats by default.